Lilia Varetsa studied art at the Kharkov Academy of Fine Art, Ukraine where she received her BFA and MA degrees in Fine Art and Interior Design. Lilia Varetsa has worked as a professional artist, illustrator and interior designer since 1976.She developed her painting and illustration skills in a variety of media including acrylic, watercolour, pen and ink and colour lithography. 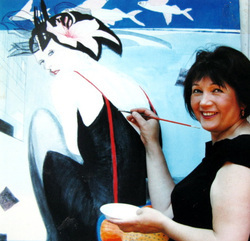 During her career, she has become known for a passionate love of fine art and a deep knowledge of art history.Her work has received numerous regional, national and international awards.With their strong sense of composition and colour, her paintings always draw the viewer back again and again.Her style can best be described as a type of modern realism, combined with surrealism and folk art.Lilia uses humour, paradox and inspiration to bring a deeper message of encouragement to the viewer. Her images have been published as art prints, calendars, post stamps, children’s book illustrations, and greeting cards. It can also be found at The National Museum of History &Culture Belarus, at the Fine Art Museum in Kiev, Ukraine, at The Olympic Museum in Lausanne and other corporate collections. Valentin Varetsa began his career as a professional artist, having studied at the Kharkov Academy of Fine Art,Ukraine and the St.Petersburg Academy of Fine Art,Russia . 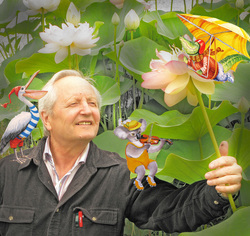 The passion for color and attention to intricate detail that earned him his Masters degree is evident in his work.He creates harmonious compositions with superbly balanced colors and shapes.Valentin’s work is a blend of colors, emotions and dreams.With dozens of personal exhibitions in Italy, Belarus, Ukraine, and Australia, Valentin has earned great respect as an artist. Valentin’s goals as a painter are clear when he says,” My appreciation of the world is always increasing and I enjoy sharing it with others through my artwork. My goal in each painting is to encourage the viewer to feel the emotions, struggles and triumphs of living free.​I often work in metaphor and I like the viewer to take from the work what they will"
Also influenced by the surrealists, especially by Rene Magritte, Valentin explores the meaning and relationship between painted and real objects, finding ways to bridge the gap between his reality and that of the real world. His techniques are based on the great classical school of Baroque and the Pre-Raphaelites. He adheres to the classical principles of unity and integrity of shapes, equality of lighting, closed forms and smooth gradations of colour. His work has appeared in many exhibitions, galleries and museums worldwide including; The National Fine Art Museum of Ukraine,The National Museum of History & Culture Belarus, National Library of Belarus,National Library of USA,in Washington. .
Valentin continues to create original artwork from his studio in Melbourne,Australia and specially requested commissions.